One of these days I'm going to write a post on five beauty products that every crazy lazy girl needs. Why? Because we all have days when we don't want to do the whole song and dance on our faces. We either want to head out or take it all off ASAP, sometimes! I just want to tell you that it's okay to cut corners and/or simplify your routine if you're just not feeling it. It's your face, it's your call. Anyway, one of my recent fave finds is the Philosophy Purity 3-in-1 Cleanser for face and eyes (P1,195). I've actually had this bottle since December but it's only now that I'm truly appreciating it. I thought it caused me to break out but this wasn't the culprit after all! I've since enjoyed how it has simplified my face cleansing routine. If you wear light makeup, or even a medium amount of makeup, this is all you need to take it off and cleanse your face at the same time. This pale yellow liquid isn't foaming at all which might be weird to those used to sudsy facial washes, but it's pretty effective nonetheless. It has a mild soapy scent. It doesn't sting my eyes but it tastes extremely bitter - so don't lick your lips even if you think you've washed off the product! I squirt a peso-sized amount on my dry palms and then massage it all over my face. I focus on my eyes, gently easing off the eyeliner, eyeshadow, and non-waterproof mascara off with small circular strokes using the tips of my fingers. No sting there so I'm not worried to really massage Purity in. Be prepared for cloudy eyes though, if a lot of the stuff gets in! After I wash off the first application, I usually go for a second just to completely remove everything, especially if I had long-wearing makeup on. I mix a bit of water with the cleanser just so it would spread out better. The second wash removes pretty much everything left over. It can take out smudgeproof and non-waterproof mascara easily, as long as it's not a tube formulation. ;) True to its promise, I can skip on using toner after washing with Purity! My face also doesn't feel dry and tight even after two washes. I love that it offers good value for the price. It's P1,195 for a 240ml bottle - I mean, even with two dollops per use, that'll still take a while to use up! Also think how much you're saving by combining your makeup remover, facial wash, and toner. 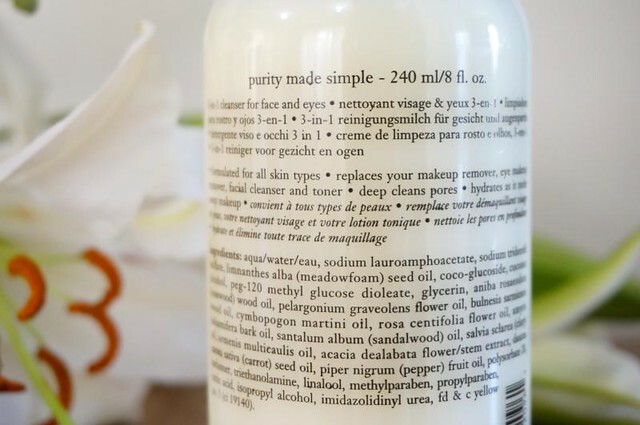 Overall, I highly recommend the Philosophy Purity 3-in-1 Cleanser for face and eyes to just about anyone who's looking to plow through a few key steps in their cleansing routine. ;) I'd still prefer to use a traditional makeup remover when I'm wearing heavy, water-resistant makeup, but most days I think I'll stick with Philosophy. It's just so convenient! What do you think? Does this look like something you need? Philosophy's flagship store in the Philippines is now open in Megamall Fashion Hall, second level.